that none of us is just an individual — we are all neighbours. In the preceding articles in this series, I offered both local and parliamentary actions that seem to lead to a "wholologistic" or "whole-system" alternative to either neoliberal or conservative capitalism, or to the many variants of authoritarianism that the last blood-soaked century of political mayhem inflicted on humanity. In the first phase of enlightenment (over, say, the past 300­ to 400 years), humans engaged in the activity of taking things apart to see, first, the things from which bigger things were made (a process of analysis), followed by a process of putting things together (synthesis). In terms of chemistry (my beloved subject), this led eventually to the production of thalidomide, much as it led to aspirin. To a considerable extent, that synthetic phase — of Monsanto, Merck, and their ilk — was driven by usury. Capitalism uses the anodyne term "fiduciary responsibility" (the maximization of shareholder "return" and "value") as a cover for selfishness, greed, and avarice — all the results of usury. This system is money-driven, but rooted in our fears. Those fears are the result of our needs — the fear that we will be hungry, cold, alone, bored, rejected. And that points to our way back home. We humans cannot un-have experiences. My knees, for example, will always remember that skiing accident, and my right-hand fingers will always throb when I'm stressed due to their having been burnt by high-strength hydrogen peroxide when I was a research chemist. But we can learn from our experiences, and that knowledge can become wisdom. So we have opportunities to learn from our experiences. Education, education, — and experience! The modern universities (more properly 'mono-versities') and their supply chain, the schools, have now largely replaced education with training. The word "education" comes from the Latin: "to lead forth," whereas "training" is a 180-degree opposite process designed to "force in" compliance. In the first of these articles, I showed a political map —mapping from reactionary to progressive on the horizontal axis and downwards from authoritarian to experiental on the vertical axis. This figure is republished here for easy reference. At the heart of the human condition there is a tension between our selfishness and our social-ness. This tension seems to have evolved from two clashing concepts of human needs and nature. One concept is that human beings are by nature selfish, nasty and violent, so strong authoritarian and hierarchical structures have to be erected to maintain order and peace. The other view of human beings is that they are inherently kind, sociable, and co-operative, and so all we need to do is remove all constraints on individual action and, once again, peace, order and harmony will result. In reality, of course, we have within us the potential for both selfishness and unselfishness, for both good and bad behaviour. These matters are interwoven with our differing personalities. There are many convergent, contemporary theories of personality (and a cornucopia of such resources may be found at http://users.trytel.com/jfalt/Rev-per-type/foll-wk.html. Of these, Carolyn Kalil's 'True Colors' approach suggests that we are all mixtures of four personality types, labelled Gold, Green, Blue, and Orange. The Gold types tend to be conservative, reactionary, and authoritarian; the Greens to be progressive, analytical and authoritarian; the Oranges to be controlling and self-centred; the Blues to be friendly, connected, and idealistic. 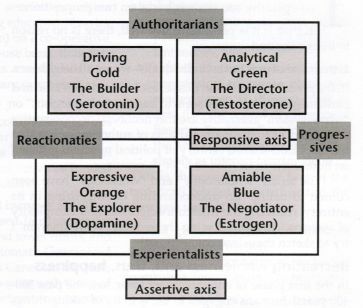 Personality type theory, of course, is still in early development. The four types of personality shown in the graphic seem to have some relationship to four neurotransmitters in brain bio-chemistry. Thus, at www.chemistry.com, anthropologist Helen Fisher points toward current research which matches the four personality types to four personality labels, which I display in the graphic. Michael Moore's delightful new movie, Capitalism, A Love Story, bells the cat. The globalized form of terrorism called capitalism, based as it is on theft, plunder and pillage, is a wickedness that degrades every man, woman and child in some way. Its evil spreads to every part of the world and beyond, driven by the sins of greed and profit. Thus, the call for the non-authoritarian, non-capitalism of co-operative socialism is a call for us to "get back to the garden" — to be fully sustainable as part of creation, not as its masters, stewards, or overlords, but as co-operators in full communion with Nature and our planetary home. 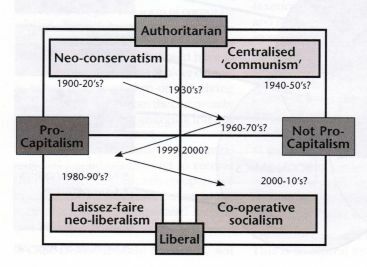 The static element in the philosophy of capitalism —"ownership" — brings consequences (war, debt, despair, ennui) that are part of the genetic code of the Tree of Knowledge whose fruit we stole at the time of the Neolithic catastrophe — the time when settled agriculture (theft of and from the commonweal) first occurred. As our forebears took possession of the commons, they themselves were possessed — of the devil of selfishness, war, and alone-ness. In that act, we cast ourselves out from grace, out from a full communion with creation. And then, as theft generated rent, rent generated money surplus, money surplus generated financial usury, usury generated "intellectual property" (the ownership of knowledge) — and all this wickedness created the architecture of oppression and inequality. Our knowledge of good and evil was blurred, and we lost the ability to distinguish between them. The evil of capitalism was cleverly disguised and propagated as the ultimate good. As Margaret Thatcher once famously declared, "There is no alternative." But of course there are in fact much better alternatives, and one of them — arguably the best — is co-operative socialism. "The real problem is that we have not been doing enough research to try and understand alternative models or alternative ways of organizing our society. What we do know at this point is that the model based on market fundamentalism does not work..."
In this series of articles, I have tried to describe a nonauthoritarian replacement for capitalism. It is called "co­operative socialism." I first wrote about it in the mid-1990s, but it has a long history, running back to the early non-Marxist progressives like Robert Owen in the early 1800s, and beyond. For perhaps 50 years, progressive movements (organized labour, co-operatives, civil society groups) have let a core activity slip. Earlier generations of progressives laid great emphasis on the education of both young and old, something we have neglected, but which we need to renew. One aspect of such an educational effort has been kept alive within some religions. The Scarboro Missions' splendid poster, "The Golden Rule," is a good example. It displays sayings and symbols of all the major religions around the world, and links them with the one decree they all share: "Wish for your neighbour at least as well as for your own family." And this "golden rule," perhaps, becomes the core philosophy for co-operative socialism.